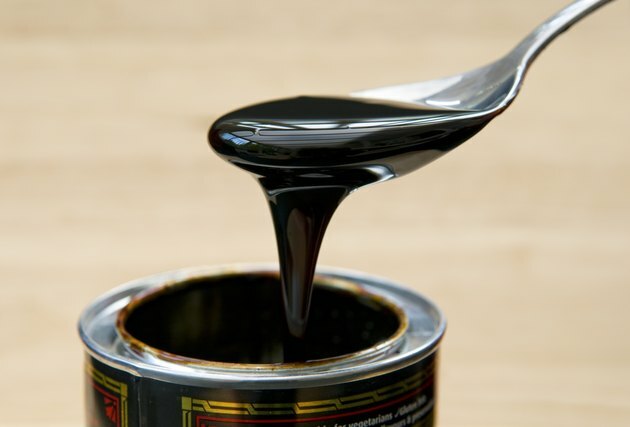 Does Blackstrap Molasses Help You Lose Weight? The only way to lose weight is to expend more calories than you consume from food so your body can burn off stores of fat. Replacing high-calorie foods with low-calorie foods that are also fiber-rich and therefore more filling will help you create this calorie deficit. Blackstrap molasses contain 60 calories in each tablespoon serving, which makes it a high-calorie food. Although it contains more nutrients than white sugar, using blackstrap molasses as a white sugar replacement or incorporating it into your diet in any way won't help you lose weight. Blackstrap molasses is made by boiling raw cane sugar syrup three times until it's a dark, thick liquid which becomes nutritionally richer with the third boil. One tablespoon of blackstrap molasses contains 14 grams of carbs. It's not a source of protein or fat, but it's a good source of micronutrients. Just one tablespoon gives you 20 percent of your daily requirement of potassium, 10 percent of your daily requirements of both calcium and vitamin B-6, and 15 percent of your daily iron requirement, based on a 2,000-calorie diet. If you happen to consume blackstrap molasses and you're trying to lose weight, it should only be in place of white sugar rather than in addition to it, since blackstrap molasses still counts as added sugar, giving you a lot of calories without filling you up.